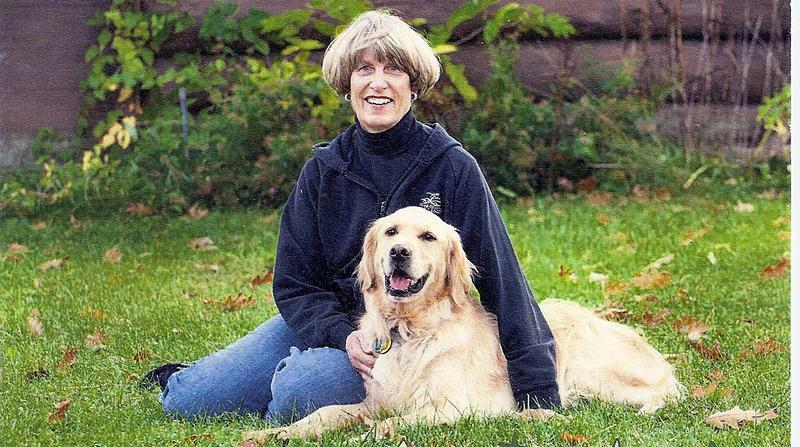 Since her retirement, Nancy Diepenbrock has spent hours training her golden retriever Quincy to be a therapy dog. For many people, dogs are a source of comfort and friendship. Nancy Diepenbrock believed so strongly in the power of a dog’s presence, she helped start a therapy dog program here in the Northwoods. "Everybody knows Quincy," said Diepenbrock. "They can’t remember my name. As a matter of fact last week one of the kids called me Mrs. Quincy." Diepenbrock is an energetic woman with short blonde hair and a very active retirement. That’s thanks in large part to Quincy, a four year-old golden retriever. Quincy is a therapy dog. When I stop by for a visit, Quincy leans his body up against me, puts his head on my knee, and just lets me pet him. "It’s amazing how much people will open up to a therapy dog," Diepenbrock explained. "I visit one lady, she has trouble verbalizing things. While she had her hands on Quincy, I could make out her saying 'oh, good dog.' Dogs will touch your heart in places you didn’t even know you had an emptiness." During a 35-year long career as a critical care nurse, Diepenbrock saw firsthand what peace dogs could bring to the stressful environment. "I was sitting at a computer doing some charting and I went, 'oh a dog!'" Diepenbrock said, "and the handler came right over to me, and he was just a perfect little gentlemen and just those big brown eyes looked at me and I just felt this relief come over me…And as I would sit there petting this dog, I always thought, when I retire, I’m going to do this." When she did retire, Diepenbrock looked for a dog to train as a therapy dog. Any breed can be a therapy dog as long as they are obedient and have the right temperament in social situations. "I started socializing Quincy from the time he was a pup," she said. "We would go to trigs and sit out in front and meet the people and I would make him sit and stay." There weren’t many therapy dogs in the Northwoods, so that meant driving—3 hours to Appleton for Quincy to take his certification test, 2 hours to Mosinee to meet with the nearest chapter of Therapy Dogs International. It’s not the only organization that brings dogs into public places to offer love and a listening ear, but it’s the oldest and largest. Unlike service dogs, who wear vests and are “at work” when they’re out with their owners, therapy dogs wear red bandanas. "To expose as much of the dog as possible to petting," Diepenbrock explained. "And then, this is not a requirement but many of the members have business cards for their dogs it’s a card with Quincy’s picture and name. And then on the back there’s … his birthday, his breed his weight his hobbies. Quincy has some very interesting hobbies like shedding or locking the cat in the shower or getting loved up - I think is his actually very favorite hobby." In February 2012, Diepenbrock rounded up other interested dog handlers to form their own Northwoods chapter. Two years later, there are 25 dog handler teams and a certification testing site in Eagle River. It takes Diepenbrock two minutes to list all the places volunteers visit. Some dog handlers go once a month. Nancy Diepenbrock and Quincy go about 3 times a week, visiting places like schools, hospitals, and a homeless shelter. At Northland Pines Elementary school in Eagle River, Diepenbrock settled onto a beanbag chair in the corner of a classroom with Quincy. Here’s he’s “Quincy the Listening Dog,” part of a program that encourages kids to read. Eight year old Halie Towne plops down in her bean bag chair with her book and promptly gets her face licked. "They LOVE having Quincy here," said Sara Adomovich, one of the teachers whose classroom Quincy visits once a month. "They know that it’s a Quincy Monday." Sara’s seen some big changes in the kids’ reading ability since the fall. "Their confidence levels increase," she said. "They’re excited to read and their fluency in reading increases. Quincy listens and he doesn’t judge what they’re doing." Quincy lays next to her as she reads. Diepenbrock said, "I tell anyone for anyone who thinks I’m doing this wonderful service: it’s actually quite selfish because it’s all for me. I thank God every day for this wonderful dog. “I do worry about Quincy if he’s going to get old what’ going to happen," she said. "And in my mind and I’m formulating plan maybe I’m going to have to start with another puppy so Quincy can teach him rules and regulations. and then we’ll have a backup too in case Quincy ever gets sick." For now, Diepenbrock is focused on bringing therapy dogs to as many people as she can. If you're interested in training your dog as a therapy dog, you can contact Northern Wisconsin Canine. Dying is something that everyone faces, sooner or later. For those close to death, hospice can make that prospect a little easier. It’s a form of care that focuses on comfort and pain relief…for those who are thought to have less than six months to live. WXPR’s Natalie Jablonski spoke with hospice volunteer Florence Reisgies, about the experience of spending time with patients in their last months of life. Florence Reisgeis volunteers through Ministry Home Care Hospice Services. That program is currently seeking new volunteers for a training next month. Eagle River is on the front end of a trend that’s becoming more popular across Wisconsin: winter farmers markets. The new effort could make local food available all year round, even in a cold Northwoods climate. When Al Pittelko, executive director of the Eagle River Revitalization Program, was approached about holding a winter farmers’ market, he hesitated.